Home > Stocks > VIX Low, Time To Go? VIX Low, Time To Go? Short-term volatility expectations plummeted during Wednesday’s post-Federal Reserve meeting stock market rally. As readers are likely aware, our biggest concern regarding stocks going into September pertained to sentiment. Almost unanimously, investor sentiment metrics had become overly bullish or complacent. And while on an intermediate-term basis (i.e., 6 weeks to several months), these conditions have not sufficiently abated, some of the shorter-term froth was alleviated during the sharp selloff in the past few weeks. In particular, despite the stabilization in stocks, we saw a bit of defensive behavior in the volatility market in the days leading up to Wed. highly anticipated Fed meeting. Specifically, traders bid up short-term volatility expectations, especially relative to longer-term expectations. That bid quickly unwound on Wed., however, in the aftermath of the Fed meeting. Specifically, Wed. saw the Short-Term (i.e., 9-Day) S&P 500 Volatility Index (VXST) plunge by more than 25%. Now granted, the VXST has only been around since late 2013. However, -25.5% still marks the 5th largest drop ever in the VXST. You’re probably wondering what happened to stocks following other big VXST drops. So did we. There are a few objective ways to separate the two samples. One method we like to use is to categorize events by the market’s proximity to its 52-week high at the time. Another way in this case that would highlight the relative degree of short-term versus longer-term volatility expectations would be to use the readings of the VXST/VIX at the time of the events. Lastly, and most simply, we could separate the samples by the level of the VXST prior to the large drop. This is how we’ve separated the results below. 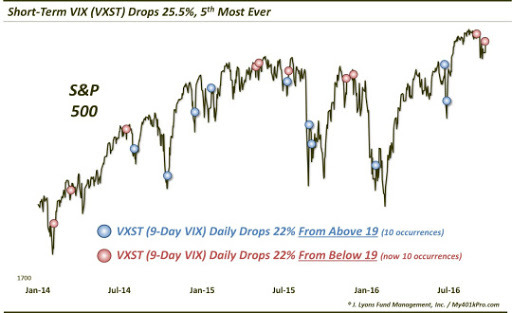 10 of the VXST daily drops of at least 22% occurred following a VXST close above 19 the prior day. These occasions suggest an elevated level of the VXST due to some degree of fear-inducing market weakness. What we’ve generally seen following prior events is that those occurring from a high VXST level, i.e., following stock market weakness, have led to superior intermediate-term returns in the S&P 500 as stocks recovered. On the other hand, when the VXST drop occurred from an already relatively low level, intermediate-term returns were sub-par, even negative, following most events. This seems indicative of traders rushing into stocks in a type of bullish blowoff with markets already near their highs. As we mentioned, the sample split was by no means perfect. However, 9 of the 10 occurring from a high VXST level saw positive returns 1 and 2 months later. And the one exception was 7/10/2015, which occurred after a very short bout of weakness while the market was topping in the intermediate-term. Among the sample occurring from an already relatively low VXST level, which includes our present case, the vast majority showed negative returns from 1 to 3 months. And even though the 6-month median return barely ticked positive, the median drawdown was an alarming -11%. The biggest exception among this sample was 2/7/2014 which showed positive returns across all time frames. However, that date had seen the S&P 500 drop 6% directly preceding the event and barely gets inclusion here in this sample with a prior day VXST reading of 18.67. This is just one data point and past performance does not guarantee future results. However, considering this rush out of the VXST occurred from an already relatively low level (17.22), prior similar occurrences suggest the upside is perhaps limited here for the S&P 500. In the short-term, Wed. bounce could certainly continue. Furthermore, the VXST has a little room to move lower than its present absolute level (12.83) as well as versus the VIX (0.96). However, the study here suggests that traders not get too comfortable in stocks following any short-term gains.